At the southern foot of the Tianshan Mountains (tiān shān 天山), edged on the other side by the forbidding Tarim Basin (tǎ lǐ mù pén dì 塔里木盆地), lies Xinjiang's desert forest, Luntai Huyang Poplar Forest Park (lún tái shā mò sēn lín gōng yuán 轮台沙漠森林公园), as oxymoronic as that may seem. 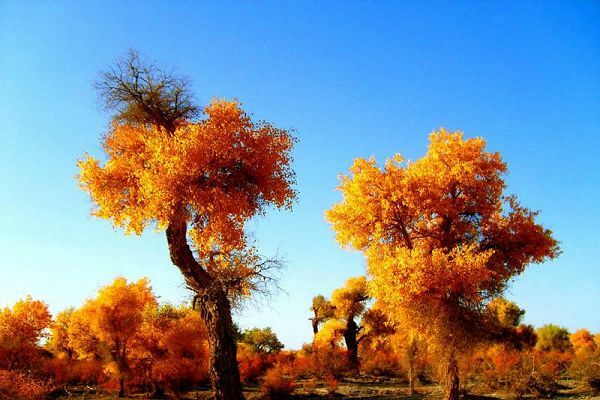 The reason life flourishes in such an arid zone is due to the Huyang poplar trees. Luntai (lún tái 轮台) is the world's largest preserve of Huyang poplars, 27, 000 hectares' worth. The Gurbantunggut Desert (gǔ ěr bān tōng gǔ tè shā mò 古尔班通古特沙漠), located in the center of Junggar Basin (zhǔn gé ěr pén dì 准格尔盆地), to the east of the Manas River (mǎ nà sī hé 玛纳斯河) and south of the Ulungur River (wū lún gǔ hé 乌伦古河). 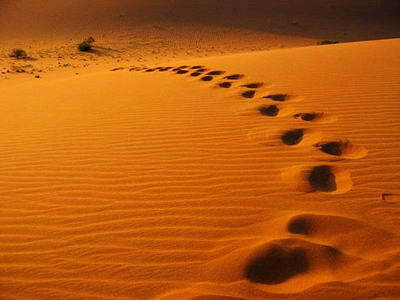 With an area of 48,800 square meters, the desert is the second largest desert in China. Its climate is temperate. Its eco-environment is very fragile, and the impact of human activities on the eco-environment, including the building of a trans-desert highway, has been increasingly significant. Kuqa (or Kuche) Gorge (kù chē dà xiá gǔ 库车大峡谷), also known as the Keziliya Grand Canyon (kè zī lì yà dà xiá gǔ 克孜利亚大峡谷) in Kuqa County (kù chē xiàn 库车县), Aksu Prefecture (ā kè sū dì qū 阿克苏地区), was discovered in summer of 1999 by a young Shepherd. 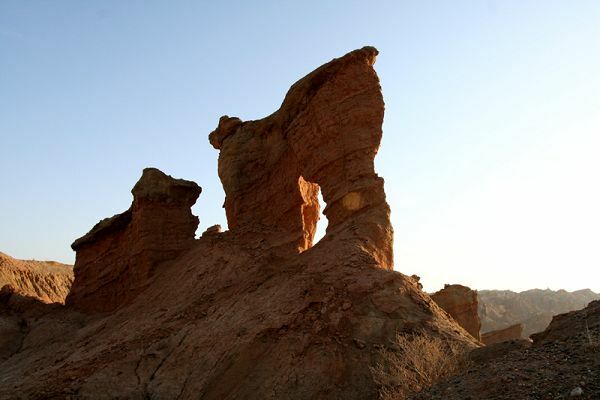 In 2003, due to it unique scenery, it was elected as one of the Top Ten Beautiful Canyons in China. UNESCO has organized experts to observe and study the gorge twice. In a stunning location adjacent to the Karakorum Highway (kā lǎ kūn lún gōng lù 喀喇昆仑公路)and near the junction of the Pamir (pà mǐ ěr 帕米尔), Tian Shan (tiān shān 天山) and Kunlun mountain ranges (kūn lún shān mò 昆仑山脉) lies Karakul (meaning black) Lake (kǎ lā kù lè hú 卡拉库勒湖). 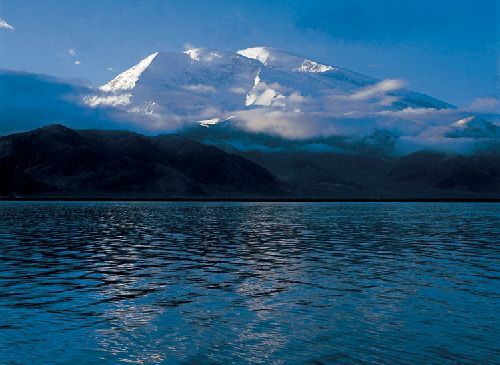 At 3,600m this high altitude lake is surrounded by much higher peaks including Muztagh Ata (mù shì tǎ gé fēng 慕士塔格峰)(7546m) and Kongur Tagh (gōng gé ěr shān 公格尔山)(7649m) This is Kirgiz country (kē ěr kè zī xiàn 柯尔克孜县) here and accommodation is rough and ready in local Yurts. Karakul Lake is a natural overnight stop on the way between Kashgar (kā shí 喀什) and Tashkurgan (tǎ shí kù ěr gàn 塔什库尔干). 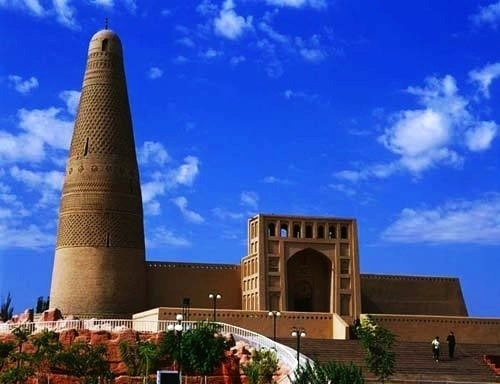 The Emin Minaret (é mǐn tǎ 额敏塔)(or Su Gong Ta)(sū gōng tǎ 苏公塔) is one of the more distinguished landmarks of the Xinjiang Uygur Autonomous Region (xīn jiāng 新疆). It is located a short distance east of the city of Turpan (tǔ lǔ fān 吐鲁番)(Turfan, or Tulufan) and near the ancient Uygur capital of Gaochang (gāo chāng gǔ chéng 高昌古城) and the cave temples of Bezeklik (bǎi zī kè lǐ kè qiān fó dòng 柏孜克里克千佛洞) along the ancient Silk Road.